Recent volatility has created opportunities to invest in high-yielding leveraged credit closed-end funds trading at a discount to net asset value. 2018 can be summed up in one word-volatility. To some, that word may have negative connotations. At BlackRock, we embrace volatility and look for opportunity. In our view, leveraged credit focused closed-end funds ("CEFs") may present a opportunity for income investors seeking attractive yields. Recent economic data confirms that the global growth is slowing, inflation remains moderate, and financial conditions have tightened. As a result, the Federal Reserve may be nearing its neutral policy rate. This Fed "pause" should benefit leveraged credit-focused CEFs that have been adversely impacted by higher borrowing costs in addition to the confluence of geopolitical tensions, growth fears and overall negative market sentiment for risk assets. 2018 can be summed up in one word-volatility. To some, that word may have negative connotations. At BlackRock, we embrace volatility and look for opportunity. In our view, leveraged credit focused closed-end funds ("CEFs") may present a opportunity for income investors seeking attractive yields. Recent economic data confirms that the global growth is slowing, inflation remains moderate, and financial conditions have tightened. As a result, the Federal Reserve may be nearing its neutral policy rate. This Fed "pause" should benefit leveraged credit-focused CEFs that have been adversely impacted by higher borrowing costs in addition to the confluence of geopolitical tensions, growth fears and overall negative market sentiment for risk assets. In today's fixed income landscape, we see opportunities to construct a much more efficient portfolio compared to a year ago to drive high income. Income can be an especially impactful force in some of these higher-risk asset classes, and price return appears considerably less important in today's post-Quantitative Easing world (see Figure 1 below). Over a long enough time horizon, income can over-power the periodic draw-downs that credit markets may endure. 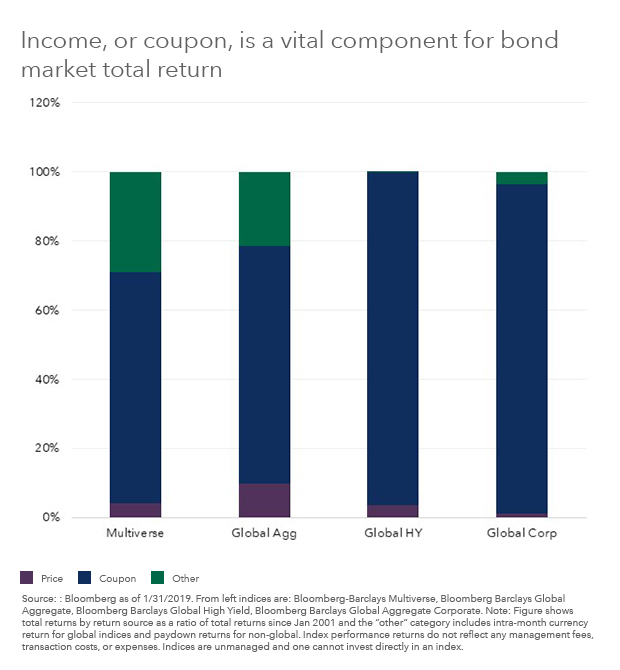 When we look over a period of many years, we find that the vast majority of returns in major bond indices come from income, or coupon. Crucial to our philosophy in managing the portfolios is our prudent, disciplined, and steady approach to helping generate solid, reliable, and durable income over a longer-run investment window. Investors with a greater risk tolerance may want to consider leveraged credit focused CEFs to achieve higher income with potential upside given attractive valuations. Within credit markets, we believe high-yield fundamentals are improving with higher rated credits driving new issuance volume and interest coverage at post-crisis highs. Meanwhile, technical factors remain supportive as the high-yield market has shrunk and valuations are looking more attractive following recent outflows. Similarly, emerging market debt valuations are starting to look attractive following significant underperformance in 2018 and the technical backdrop has become more supportive. 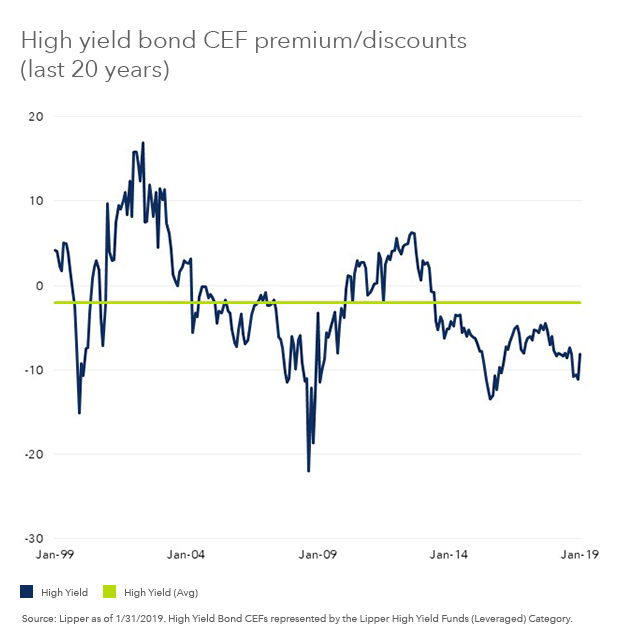 Leveraged credit-focused CEFs such as high yield and multi-sector strategies have experienced significant discount widening amid heavy tax loss selling at the end of 2018 (see figure 2 below). Current discounts are at levels much wider than their long-term averages, further increasing already attractive yields. For example, as of 1/31/2019, leveraged High Yield CEFs were yielding 7.8% on a net asset value ("NAV") basis. 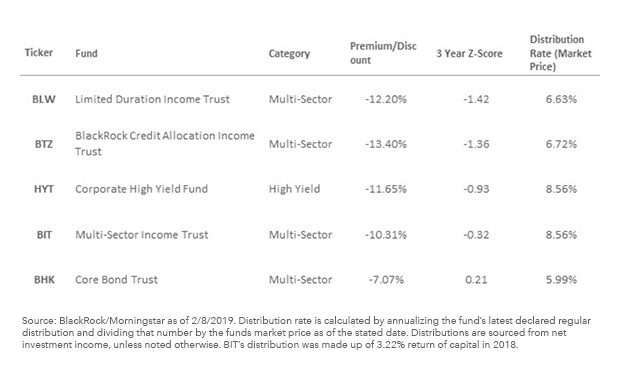 However, given the average discount to NAV of 8.4%, the average yield on market price is currently 8.5% based on the Lipper High Yield Funds (Leveraged) category. We believe the combination of high income and potential capital appreciation from rising bond valuations, in addition to narrowing discounts, presents an attractive entry point for long-term investors with a higher risk tolerance. This post originally appeared on BlackRock Blog.